Perform the procedure using a cloth to cover sharp edges which could injure your hands. 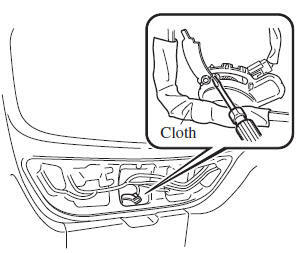 Perform the procedure carefully when using a fl athead screwdriver as it could cause damage to the surrounding area or vehicle parts. Fold down the rear seatbacks. Refer to Split/One-piece Folding the Seatback on page 2-7 . 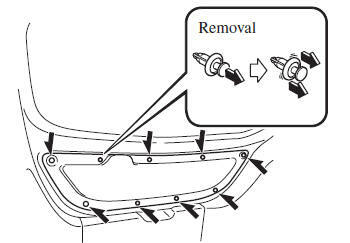 Pull the centre section of the plastic fastener and remove the fasteners, then remove cover on the interior surface of the liftgate. Using a fl athead screwdriver, open the inner cover. 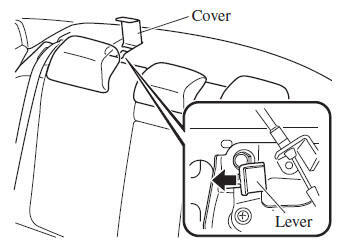 Using a fl athead screwdriver, turn the lever to the right to unlock the liftgate. Move the lever to the left to fold the seatback. 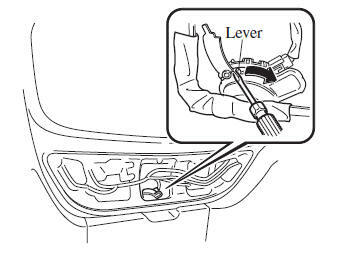 Move the lever to the left to open the boot lid. After performing this emergency measure, have the vehicle inspected at an expert repairer, we recommend an Authorised Mazda Repairer as soon as possible.